(Newser) – Marc Summers and David Chambers got their start in defense logistics, but their company, Trident Support Corporation, now focuses on something rather different: Building really, really big flagpoles. They built the tallest one in the world, a 541-footer in Dushanbe, Tajikistan; they also built the prior record-holder in Baku, Azerbaijan, which is 531 feet. Ashgabat, Turkmenistan had the tallest before Baku—and it was also built by Trident. 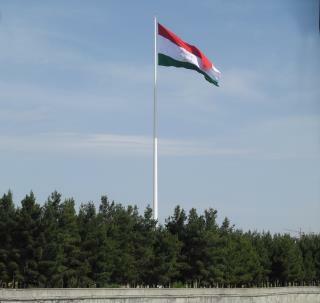 In fact, the company has built "the six tallest free-standing flagpoles in the world today," according to its website. It's all part of what Vice calls an "arms race" of sorts between authoritarian governments in Central Asia and the Middle East. Ham operators will often use a flag pole or what is called a push-up pole for an antenna. Have they considered marketing them for cell, radio, or tv towers? 541 feet is very respectable for a self supporting tower. Wind loading is an important consideration for a tower and a flag has to have the worst wind loading stats. So their towers would have to be made under very strict quality standards. I say they can get into secondary markets very easily considering how popular self supporting towers are and you don't have to buy up land to put the guy wires. Just makes it easier for the birds to s#it on their flags. The taller a nation fly's it's flag the lower they are on the world's totem poll. same thing goes for car rearview mirrors.